It is hard to understand how someone can drive a car into the oncoming lanes of a divided highway, but these types of car accidents happen all the time. They may involve a driver who simply pulls into the on-coming traffic lane on a busy two lane Florida road like State Road 64 or State Road 70 in Manatee County. But, they also occur on divided highways like the Courtney Campbell in Pinellas County or I-75, I-275 or I-4 in Hillsborough County. When these crashes happen at highway speed the chances of a fatality rises dramatically. Almost any crash on a state highway or divided interstate highway will involve a high speed impact. The unfortunate common denominator is a driver who is under the influence of alcohol, although driver fatigue also ranks high on the list of causes. The cause of these crashes is clearly the driver in the wrong lane. Regardless, the defense will always look for ways to put some fault on the innocent driver for not avoiding the collision. In our experience, it is almost impossible to avoid a car coming at an oncoming driver in the same lane. The combined speed of the cars reduces the perception and reaction time or opportunity of avoidance so dramatically that avoiding a collision is virtually impossible. This is especially true when a vehicle in front of the victim's car manages to swerve out of the way of the oncoming car at the last second exposing the following car to an immediate crash. In addition, many of these crashes happen at night when the opportunity to recognize the oncoming vehicle immediately is greatly reduced. 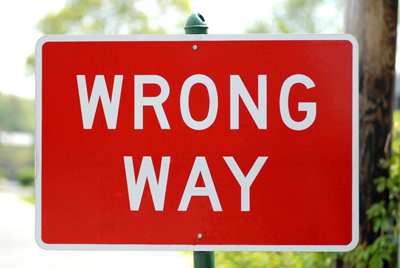 If you have been involved in a wrong-way crash anywhere in Florida, don't let an insurance adjuster suggest you or a loved one was partially to blame for not taking evasive action.